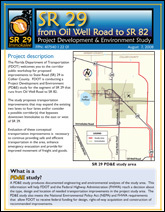 The Florida Department of Transportation (FDOT), in cooperation with Collier County and the Federal Highway Administration (FHWA), held a corridor public workshop for the S.R.29 Project Development and Environment (PD&E) study. 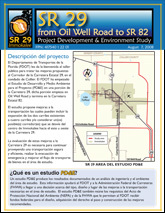 The study proposes improvements to S.R.29 from Oil Well Road to S.R. 82 in Collier County from the current two lanes to four lanes. The workshop was from 5:00 p.m. to 7:00 p.m. on Thursday, August 7, 2008 at the Immokalee One-Stop Career Center, 750 South 5th Street, Immokalee, Florida. Click on the icons below to view the video presentation, project handout, in both English and Spanish, and the graphics that were on display at the workshop.